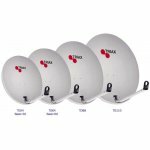 Multidirectional antenna AN6001M is used to receive signals of analog and digital TV (DVB-T/T2) in UHF bands (Channels 21- 69 ). Manufacturer: Engel Axil S.L. (Spain). 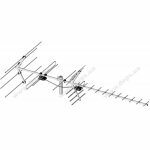 Active Mini Log antenna AN6009A is used to receive signals of analog and digital TV (DVB-T/T2) in UHF bands (Channels 21- 69 ). Manufacturer: Engel Axil S.L. (Spain).